#101 - 33391 Maclure Rd. "Would highly recommend! Marr-Tech Kitchens Ltd. was mostly positive. They remodeled my whole kitchen. Overall, we were happy with them. They did a great job, and I would recommend them to others." "Good service all around! I had Marr-Tech Kitchens Ltd. do some work on our kitchen installing some cabinets a little while back. Everything, from the start to the end, was great. They listened to what we wanted and made some suggestions, but didn't shoot down any of our ideas. We did have some specialty cabinet which turned out to be a little undersized, but they took it back and re-did it without any problems. I recommend their service!" "Fantastic! I love my new kitchen Marr-Tech Kitchens Ltd. redid the kitchen cabinets and counter tops. The cabinets were excellent but we had some issues with the counter tops. However, Marr-Tech was able to resolve it. It was discussed with me ahead of time so I saw all the plans, designs, and options beforehand to get a sense of what they were going to do." "I would highly recommend them. They exceeded all our expectations. It was our first time using Marr-Tech Kitchens Ltd. We looked online at three different companies and were most impressed by their commitment: they consulted with us on 3 different occasions without even asking for any money. It turned out really good and the timing was perfect. They promised us that they would have what we ordered within 30 days. The installation of our kitchen cupboards and quartz countertop was very smooth with no headaches at all. It was a lot of work and measuring because we tried to keep our backsplash and ceiling intact and they were so conscious of this and so professional in how they tried to help us. Everyone went the extra mile for us to make us happy and they succeeded. I would say that if you want great and conscientious service you should go to Marr-Tech because every little detail was worked out ahead of time and it made everything go very smoothly." "Excellent! Marr-Tech Kitchens Ltd. did my entire kitchen and two bathrooms. It was my first time using them, and it turned out extremely well. They know how to do it right!" "Efficient, punctual, and respectful workers. Good prices. Great workmanship. Marr-Tech Kitchens Ltd. built a new kitchen for us with all new counter tops. 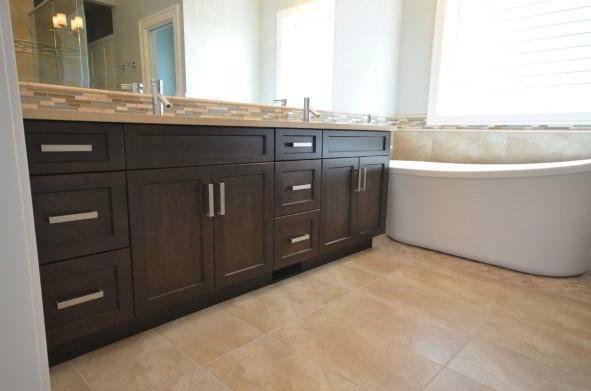 They also installed three bathroom cabinets. 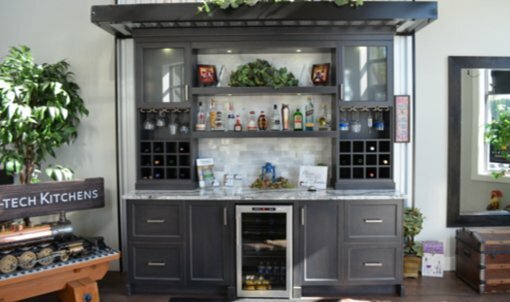 They supplied two of the cabinets, and we supplied the third. All in all, the project took about two months. It was quite fast considering some work that we had to get done before they could complete certain jobs. The workers were efficient, punctual, and respectful. They came back to fix every little problem that we had no questions asked. Their workmanship was excellent. The price was good. It was a great experience. These guys would totally be someone I would recommend." "Absolutely wonderful! Tracey from Marr-Tech Kitchens Ltd. was absolutely wonderful. Tracey is the designer and she came in and did an amazing job. She gave me lots of ideas I would never have thought about doing and my kitchen would not look like this without her ideas. As far as the company is concerned, they were a good company to work with but I really valued all the advice Tracey gave me. For example, she told me how nowadays, they make cupboards smaller so they can't fit bigger plates so the doors won't shut properly. It's little things like that she brought up that I thought were really helpful." "Excellent service! I would actually recommend Tracey from Marr-Tech Kitchens Ltd. above anyone else. She designed the kitchen completely and did a really good job." "Very positive and the staff was extremely helpful! We did a total renovation of our kitchen that had us go from scratch. Marr-Tech Kitchens Ltd. did the cabinetry while they pointed us to the right place for counter tops. They spent lots of time over the design as we went through several different options. The staff was very helpful and very patient overall as the project went on for months." "I'm completely happy. I love my kitchen. It was quick and painless. Marr-Tech Kitchens Ltd. was awesome. They did great with me. Everything has been great. They took personalized care of me. Any issues I had were dealt with immediately. In fact, they foresaw things I didn't and dealt with them swiftly. They're complete pros." "Bumps along the road but very happy with our kitchen! 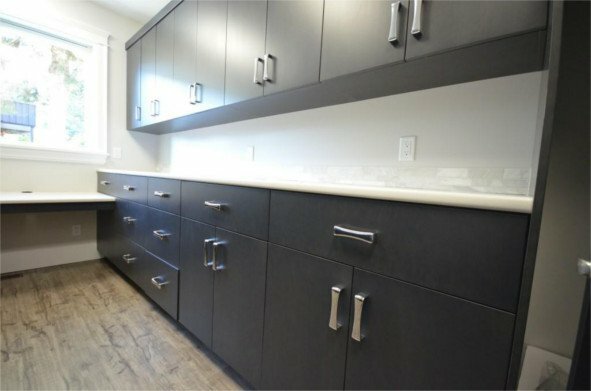 Marr-Tech Kitchens Ltd. did a total kitchen revamp with our counter-tops and cabinets. There were a few bumps in the road but that can be expected with a reconstruction like this. The first bump was that we agreed that the project would be completed in the month of May but when it came time to start, their slip said June so there were three more weeks where we didn't have a kitchen! Then there was an issue with our microwave, its position was all whack but they came back and re-positioned it. Third problem was that we bought a new refrigerator but when the kitchen was done, we had to get a smaller one so it would look better. Like I said, with a reconstruction like this, I can't really blame them for anything. There will be mistakes but they made amends and fix whatever needed to be fixed. We're really happy with our kitchen. They have very good products as well. So much so, we have them working on our bathroom right now. Go in and see their showroom and talk to Tracey!" "Very good. I felt that they gave me really good advice throughout the project. Every recommendation they made was really smart. We are very pleased with the finished product." "My kitchen is outstanding and everyone loves it. 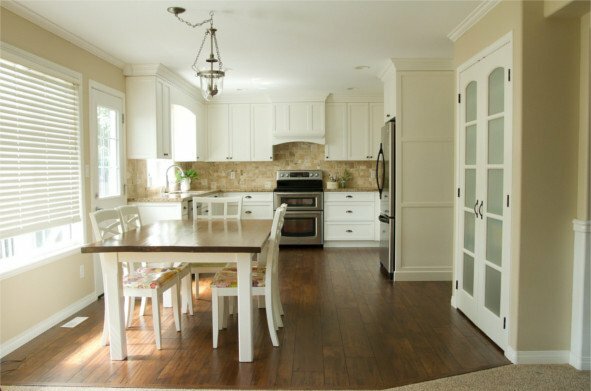 We built a house and designed the kitchen from scratch with Marr-Tech Kitchens Ltd. The end result is exactly what I wanted. Plus, the customer service was excellent." "High quality work. I checked around for prices and they came in around the cheapest. Their quality was way better than the other ones I looked at." "All work was done to our satisfaction. We had Tracey, the sales lady, come to our house and meet with us. We enjoyed the experience we had with her. She showed us different ways of doing things, things we may not have thought of. We went with them to do our kitchen cabinets. The workers were very professional and helpful." "Expert renovation! Our designer expertly and patiently guided us through the renovation process making our first reno-project an exciting and rewarding experience. I enjoyed working with the people at Marr-Tech Kitchens Ltd. and I found them to be honest and hard working. I appreciated and was impressed with their prompt attention to a couple details after my cabinets were installed and the kitchen was finished. Positive customer relations such as this will earn them repeat customers and respect in this fiercely competitive business." "It was a really good experience. They came on time and kept us up to date on what was going on the whole time. We thought we had the electrical system all ready for them, but it turned out they needed a different system. Instead of telling us that we should get an electrician and they would come back when it was ready, they went out and got the wire and put it in. They also never charged us for that, which was amazing." "They were excellent. They were excellent right from design all the way through. They were very accommodating. They listened to what we said, and went down the road we wanted to go down. They showed us different options to help us get the best match." "They've done great work for us. We bought a new house this summer and we were able to work with Peter from Marr Tech do build our dream kitchen. We couldn't be happier with the result! We felt very confident working with him and trusted him, and that really paid off." "Exceptional Quality, Exceptional Service! As a designer for Ellason Signature Homes, I have dealt with Marr-Tech Kitchens Ltd. for over 5 years and I have been exceptionally happy with their quality and service. I deal exclusively with Peter and when he designs my kitchens he is able to put all my ideas together beautifully. He then takes it one step further and keeps throwing out ideas to make our kitchens spectacular and one of a kind. As well, my clients rave about the outstanding follow up service they receive from Marr-Tech. My one client damaged her cupboard and Marr-Tech came out right away to fix it with no cost to my client. 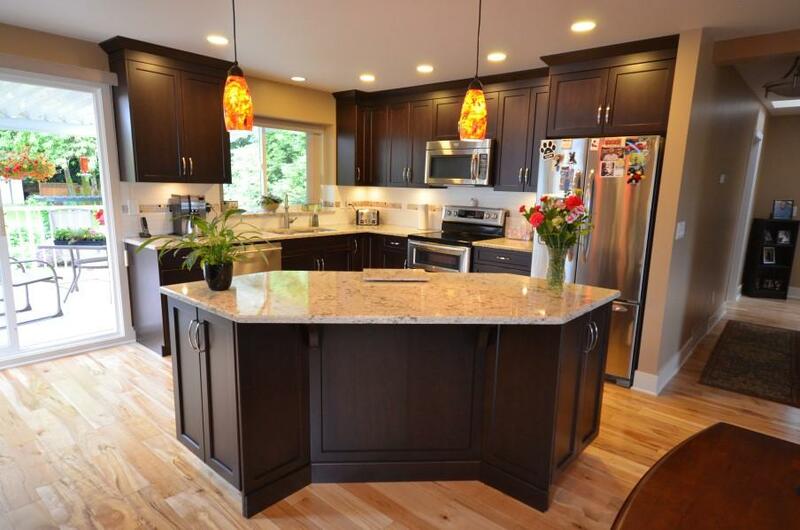 I would highly recommend Marr-Tech Kitchens Ltd. to anyone in the market for new cabinetry." If you came here looking for ideas then you have come to the right place. The kitchen is where meals are served and everyone in the family is given an opportunity to share their highlight of the day. Here you will find kitchens we have designed with a wide range of finishes, door styles and room layouts. Do you crumple or fold your toilet paper? We know it's none of our business as to what you do in there, however, we do know what is... making it a pleasant experience. Take a look at our vanity photos for ideas. Maybe you will find a better place to hide your toilet paper stash. Laundry rooms are a must have for families always on the go. There are plenty of storage options when it comes to washing, drying and storing your homes must always-be-ready items. Come take a look at our photos for inspiring ideas! Whether it is sports related or just doing the laundry, we can design you a laundry room that meets your family's needs. With so many choices available, when it comes to deciding which finish, door style, or handle to choose, we recommend you visit our showroom and ask to speak to one of our knowledgeable sales staff. We can offer you advice, work with you on meeting your projects budget and suggest helpful ideas that will bring your dream kitchen to life. You may never want to leave your kitchen again! Copyright © Marr-Tech Kitchens Ltd. All rights reserved.